I bought a DD-12 new in 2006. On the positive side, it produced prodigious bass in my home theater. For a discounted price of $2,000, it should produce prodigious bass. I give it five stars for performance, but see the weaknesses below. On the weakness side, the built in amplifier went out after just four years of use. It cost hundreds of dollars to have a new amp installed. The amp went out again two years ago, and surprise, Velodyne no longer makes a replacement amp. I would not buy another Velodyne. The warranty was, or is?, just two years on the amp., and there is no long term customer support from Velodyne. 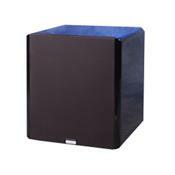 There are other subwoofers out there that offer a five year warranty on ALL parts. Fast, clear, musical sub. High level of tweakability and control, and can account for multiple variables. Great performance for price paid. Very compact for level of performance. Would like to be able to save multiple EQ configurations. No serious weaknesses. My main system is of a respectable quality, and more than capable of satisfying low end, in a room without major issues. My speakers are Thiel CS3.6's, and they are being driven by a pair of Theta Digital Enterprise monoblocks. IMHO, in most situations, there is no need to supplement 3.6's with a subwoofer (not for music, at least). Unfortunately, my room has major bass issues (one "wall" is an open archway to another room, there are two hallways leading off, there is a large sliding glass door on one wall, and I have high, sloping ceilings). With these problems, the low end is almost non-existent without a subwoofer. I had heavily considered Thiel's own excellent subwoofer, the SW1. However, after talking to my dealer and the folks at Thiel, the consensus opinion was that in my room, I would need a subwoofer with a high degree of control and EQ options to address, and correct for, my room deficiencies. With that in mind, my dealer recommended that I listen to a Velodyne DD-12 (actually, it was his first recommendation, before I even got into the particular issues facing my room!). Let me tell, you I am glad that I did. In the dealer's listening room (which has no major issues), I was able to hear my 3.6's (with associated equipment equivalent to what I have at home) both with and without the DD-12. These listening tests confirmed that 3.6's normally do not need a sub (and proved that mine were functioning correctly), but also showed me that the DD-12 was certainly worthy of pairing with the Thiels, and that it did not draw any attention to itself (which I consider high praise for a sub). I was impressed enough to buy it on the spot. However, once I got my new DD-12 home, I was in for a shock! After listening just after my initial setup (with minimal, but fairly effective fine tuning of the many, many variables controlled by the DD-12 - phase, polarity, servo control, crossover points, 8-band parametric EQ, etc. ), I already knew that I had just made the most significant upgrade to my system by far. And some of my other upgrades have cost several times what I paid for the DD-12! I had tried other subs in my system, but their presence was obvious, and they were definitely not in the same league as my Thiels. The DD-12, though, feels right at home in my system. Now, my low end issues are all but non-existent. The difference is not subtle at all (as it was in my dealer's room). Running the Thiels full range, and then engaging/disengaging the DD-12, the difference is between satisfying, balanced (not overly loud) bass, and an obviously lack of low end support, with far too present mids and highs (please note: the Thiels did not suffer from this at all when set up in my dealer's room). In addition, the higher notes now have the proper foundation and support, and as a result sound much more natural and realistic. Male voice and piano have benefitted tremendously. The DD-12 is very fast, very tight, very controlled and very musical. As happy as I was with the initial results, as I have continued to tweak, the resulsts have improved incrementally. I now have a fairly flat frequency response, with only a few minor peaks and valleys left (which I hope to address with room treatments). I have already performed one software update, and it is a breeze! In fact, all of the tweaking is easily done with the supplied microphone and remote. The Night Mode is especially nice when you have little kids who are asleep, and you want a one-buttom solution to shaking them out of bed. Don't let the fact that Velodyne sells some more affordable subs lead you to believe that they can't make a top-flight product capable of keeping up with some of the best gear out there. The Digital Drive series can provide sonic enhancement to nearly any system. Consider me very impressed.